“Our opposition to the Touro Mine is about defending a way of life, defending long-term a different kind of industry for the region”, says Luis Gallardo. Luis is from Galicia, an autonomous province in the northwest of Spain. He travelled to London to attend Atalaya Mining’s annual general meeting (AGM) on 27 June. The Spanish company is listed on the UK’s Alternative Investment Market (AIM), as well as the Toronto Stock Exchange (TSX). Luis has never been to a mining company’s AGM before, but this year is different. Atalaya has plans to open an old open-pit copper mine in Touro, a town in Galicia. The company states support from the Galician government and local communities. Campaigners dispute this. They point to recent regional government reports focusing on the detrimental impacts of the project on water, land, environment, health, the local economy and the lack of risk assessments. On 10 June, over 50,000 people demonstrated against the proposed Touro mine in Galicia’s regional capital, Santiago de Compostela. Politicians from across the political spectrum joined the protest, including figures from Galicia’s governing People’s Party. “People are not going to allow the project to go on”, says Luis, speaking on behalf of Plataforma Touro O Pino Non (Platform No to the mine in Touro and O Pino). “We are coming to the AGM as part of our activities to stop the mine. We want to ensure that investors in London understand that this is an impossible project and that Atalaya is lying to the Galician government, to the society and to them. We are here to explain the truth about the project: it is flawed, technically bad, environmentally harmful, is not viable, is not welcome and it won`t be approved”. 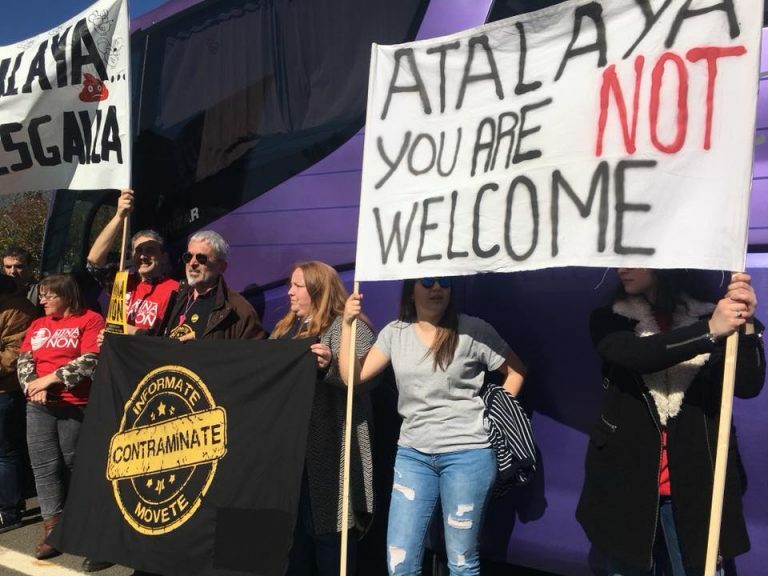 Plataforma Touro O Pino Non was formed after resistance to the project began in August 2017 with the support of ContraMINAcción – a network opposing destructive mining in Galicia. Their concerns include contamination, noise and dust of the planned explosions, water scarcity and land-grabs. The project will use more than ten tonnes of explosives a day; those involved in Touro’s tourism industry centred around the Camino de Santiago pilgrimage wonder what will happen to the tens of thousands of tourists the trail attracts every year. Galicia is already a prosperous region, says Luis. The affected area’s economy is based on farming, the dairy industry and a modern fishing industry. “The water courses surrounding our villages are already contaminated because of the old copper mine. A new mining project puts all these industries at risk. Atalaya’s plans to acquire 80 percent ownership of Proyecto Touro (Spanish company Explotaciones Gallegas owns the other 20 percent) are at the permitting stage. Although the project will partly be located at the site of an old 700-acre copper mine, Atalaya is seeking to expand the site to 1,827 hectares, taking in agricultural land and forests in the process. The company intends to operate the mine 24 hours a day, with a projected lifespan of approximately 15 years. When I ask Luis what people in the UK and Europe can do in solidarity, he says that the impacts of this project are no longer just local, but regional and beyond. “Our strength is growing, and we are getting more support every day, from concerned citizens and organisations from inside and outside Galicia and Spain. We are connecting with other people affected by mining around the world. “Everyone is invited to participate in organising activities and raising these issues by all possible means. Every person is invited to know the region, the project, its impacts on our lives, and to stay in solidarity with our struggle”. Luis Gallardo was at Atalaya’s AGM in London on 27 June, representing Plataforma Touro O Pino Non, along with Elena Solis, an environmental lawyer from Ecologistas en Accion who spoke about a question about Atalaya’s mismanagement of tailings dams in Andalucía. This was the first time that the company had to answer questions from campaigners. Read our joint press release and follow @Londonmining for what happened on the day.